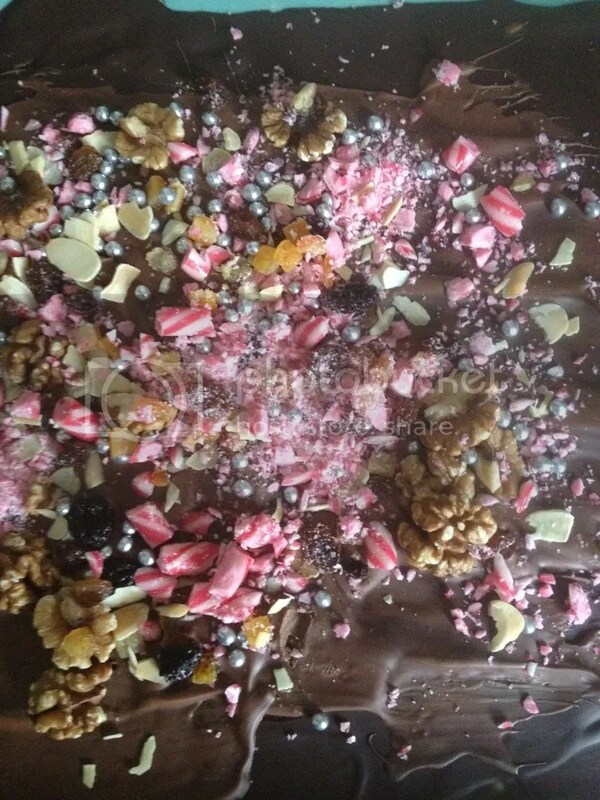 You know how chocolate bark looks massively impressive? That thick, burly, clenched feel only melted and re tempered chocolate has? The satisfying SNAP it makes when you break a piece off? The sense that each piece of topping has been carefully placed to ensure its an artisanal delight, something which people will look at for months and admire, the distilled essence of a winter’s night indoors, watching something, perhaps Poirot, on TV and sipping tea? 2.The cooking process is really simple. 3.The cooking process is really fun. 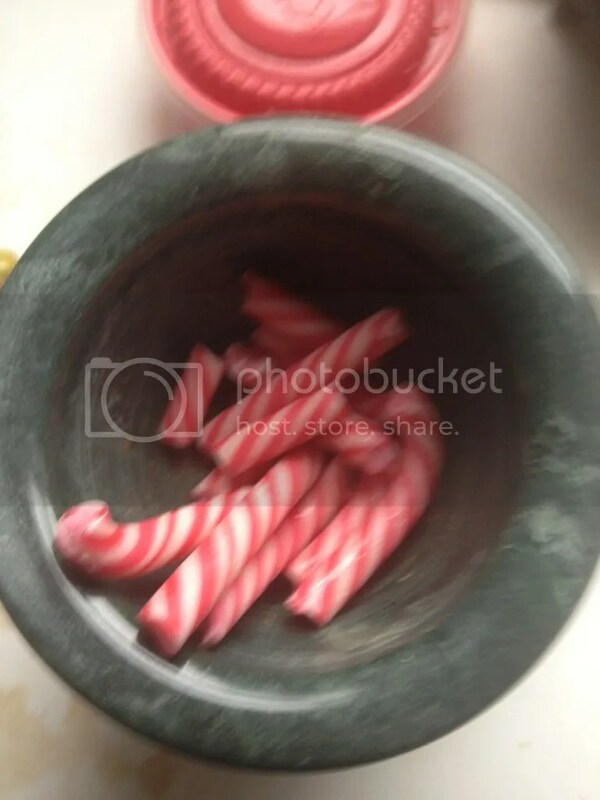 4.The cooking process involves brutally assaulting candy canes. So, round up the usual suspects Victor Lazlo! Which is now the name of my iphone camera! -Dark chocolate. I used this as the base, so there’s a full bar there. Go with more of the base chocolate than the coating because it’ll look cooler and because the base needs to fill the pan as much as possible. I was able to mostly cover an average sized silicon baking sheet with a full bar so two will fully cover it, and get you a decent thickness. Three full bars will get you what’s essentially a very large, entirely chocolate bar cookie and at four bars,The Big Show will personally fly to your house and punch you in the heart as hard as humanly possible. I’d stick with one. Maybe two. Y’know. ’cause. -Milk chocolate. The topping chocolate for me. Use less of it, because otherwise you’ll end up with one of those chocolate tombstones Hotel Chocolat sell (Although that’s not necessarily a bad thing…). -Toppings. GO. CRAZY. Seriously. I went with raisins, candied orange peel, shaved almonds and Candy canes. You can do pretty much anything here; marshmallows, chocolate chips, fruit, go with your heart, seriously. -A silicon baking sheet that fits said baking tray. Silicon baking sheets are amazing because whilst they aren’t quite indestructible, you can see indestructible from where they live. Lay the sheet on the tray, and you’re good to go. So that’s the first stage. Now, what was this about Magic Food Science? 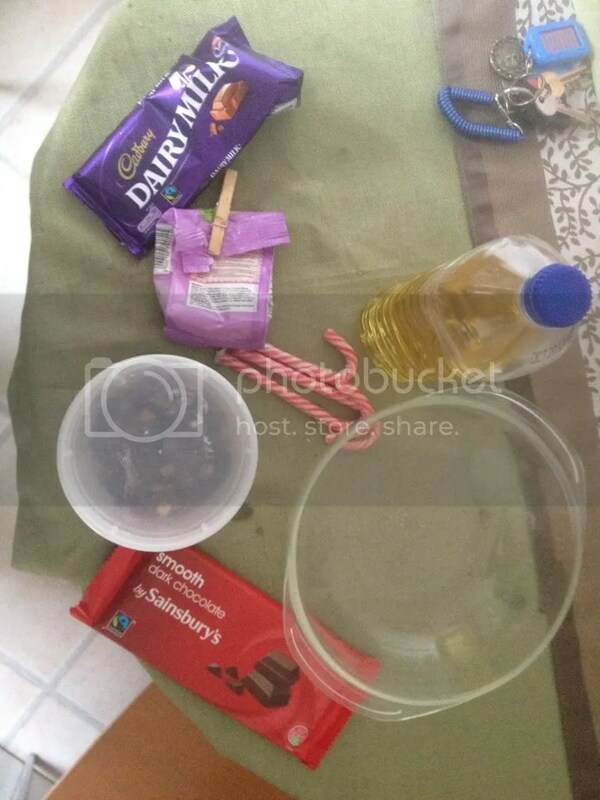 Set a pan of water to boil and once it has, pop the glass dish over the top of it, put the splash of vegetable oil in there and then the base chocolate. Technically you should probably break the chocolate up first, but as we appear to have a hob heated by the offshoot from Vulcan’s forge, I didn’t both. Stir it around until it gets nice and liquid and then pour it out onto the silicon baking sheet and put it in the fridge for 30 minutes. Then melt the topping chocolate down, take the base chocolate out of the fridge, pour it on top and put it back in the fridge. You don’t even have to clean the bowl as it’s all going to the same place anyway. WIN! Now? It is time to do horrific violence to candied treats. Marguerite has a beautiful pestle and mortar which I used for my own particular path of destruction, a path so intense that it caused a focus shift in the picture. All you do is break the candy canes up, remove them from their cellophane wrapping and then pound them into dust and slightly larger fragments. Once this is done, just put them in a bowl, add the other toppings you want and hand mix them so you’ve got a good mixture. 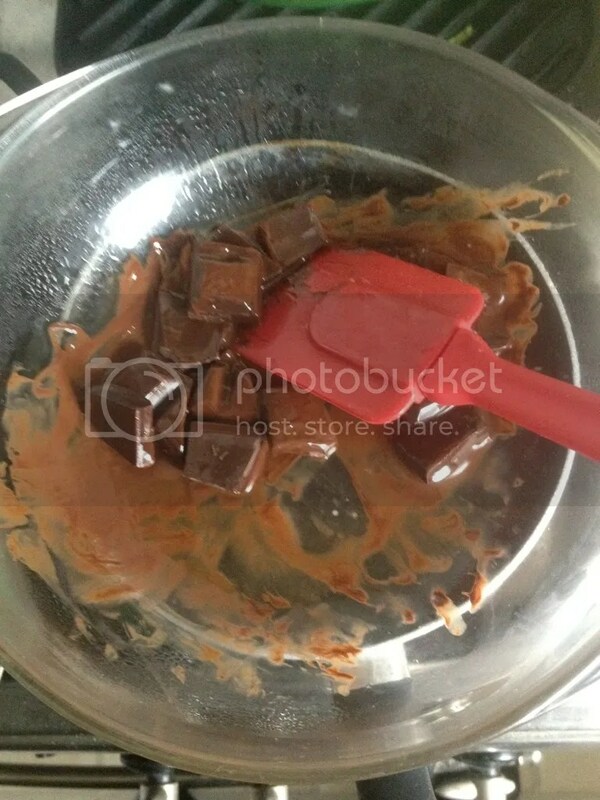 Then take the still tempering chocolate out of the fridge, scatter the toppings liberally over it and wait 30-45 minutes. Or, make the honey biscuits whilst you’re waiting, they take about that long. Once it’s done, take the bark out of the fridge and it should look like a Chocolate Factory and a disco did desperate, sweaty, drunk things to each other. Then just peel the silicon baking sheet off the back of it and like magic the entire thing will remain intact. Although a little bendy if it isn’t quite thick enough. Then cut it into sections, and store them for the eight to ten minutes it’ll take for them to be consumed. Job done. Now, I did two things wrong with this batch; made it too thin and didn’t leave it in the fridge long enough. So, my next batch will be twice the thickness and stay in for a couple of hours to get it good and tempered. I may also experiment with flavors, maybe peppermint, or go the white chocolate/cranberry route. Regardless this is a ridiculously easy thing to make, especially as most of the process is literally ‘Break and melt things into one’. If you’ve got no experience cooking, or no experience working with chocolate, go with something like this. It’s easy, it’s fun, it looks and tastes amazing and it involves the creative destruction of candy canes. What’s not to like? Next Happy Cyberpunk 1st Edition Day Everyone!